home Blog Minnesota’s Own – JUDY GARLAND ! 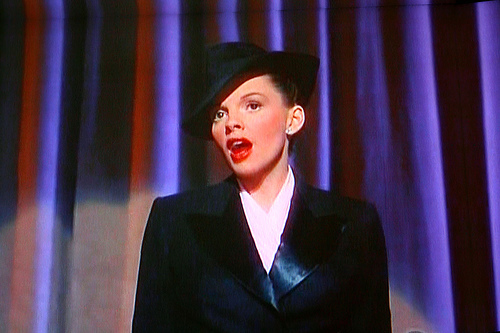 Minnesota’s Own – JUDY GARLAND ! Eighty-nine years ago today, Frances Gumm was born in Grand Rapids, Minnesota. In 1935, she signed a seven-year contract with MGM, the biggest motion picture studio in Hollywood. In 1939, she shot to international stardom as Dorothy in “The Wizard of Oz”. Frances Gumm was better known as JUDY GARLAND. It was a rough and rocky road for the young girl who first entertained audiences at age two in her father’s theatre. Musical hits like “Meet Me in St. Louis”, “The Harvey Girls” and “Easter Parade” kept her at the pinnacle of Hollywood stardom in the 1940s, even though she battled personal demons and drug addiction in her private life. Today Garland is considered one of the great icons of 20th century American entertainment. East Central Regional Library has a wide variety of materials pertaining to Garland that can be requested and checked out. “Get Happy” by Gerald Clarke is the definitive biography, while “Me and My Shadows” by Lorna Luft is an enlightening, bittersweet memoir written by Judy’s second daughter. If you enjoy musicals, look no further than our DVD collection. “Meet Me in St. Louis” (1944) is a gentle, nostalgic look at a Midwestern family during the 1904 World’s Fair. Judy and Van Johnson play feuding music store clerks destined for romance “In the Good Old Summertime” (1949). And in “A Star is Born” (1954), she gives the finest performance of her career as a young singer rising to stardom while her husband battles alcoholism. Garland received her only Academy Award nomination as “Best Actress” for this film. To find these materials — and more, including music CDs — visit the library’s homepage: www.ecrlib.org and click on “ECRL Catalog” on the upper left. Then enter “Judy Garland” as a keyword search. Staff are always willing to help or make suggestions!